I'm Kate, mum to Eleanor (aged 2 years). We had lunch late today because Eleanor fell asleep in the car on the way home from the supermarket but I thought you might like to see a picture of it. We both had the same: tomato, cucumber, coleslaw, tuna mayo sandwich and some mini cheddar biscuits. We had orange juice to drink. It's been really hot here in Bristol (UK) today, so I wanted to make something light and fresh tasting. I try to put a range of food groups on Eleanor's plate at each meal but she doesn't usually eat everything on her plate. From all the things on her lunch plate today, she ate the coleslaw and the cucumber. She also drank the orange juice. I'll probably put the rest of it back in the fridge in case she wants a snack later, before dinner. I used to live in Bristol when I was a toddler... (im 11 now) and I remember it being very hot! Yummy bear sounds quite a good description of it! Hello Mum Kate and Eleanor, it certainly is warm here isn't it, a little too humid for my liking though. I can fully agree with your daughter and I also do not want to eat lots in hot weather - especially if it is hot food. I much prefer a little nicely chilled salad. Thank you for a lovely post and enjoy the rest of the nice weather and I hope you have a paddling pool. Pretty disappointed you guys do so many US posts but still haven't had an Australian one! Look out for dinner! Blog having a whole week in Perth next week with a fantastic young guest blogger called Pavlova. I'd quite that lunch if Eleanor doesn't want it? Looks lovely and eating with fingers is a pleasure we learn to aviod as adults. Eleanor loves eating with her fingers - much better than using a spoon or a fork! However, I can confirm there were no leftovers! 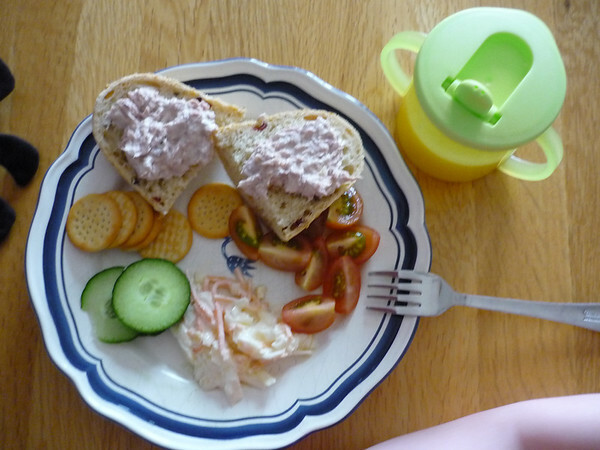 She had the tomatoes mid-afternoon and then ate the tuna (but not the bread). The mini cheddars were snaffled by her dad when he came home from work and the bread (a bit soggy by that point) was donated to the bird table!